← Do Bolivian entrepreneirs use the web as in many other countries? Another undeniable “contribution” of current Bolivian gov! Worked on the border between Santa Cruz and Beni. The FELCN seized cocaine hydrochloride and chemical precursors. Two arrested. The drugs were transported from Peru for refining. 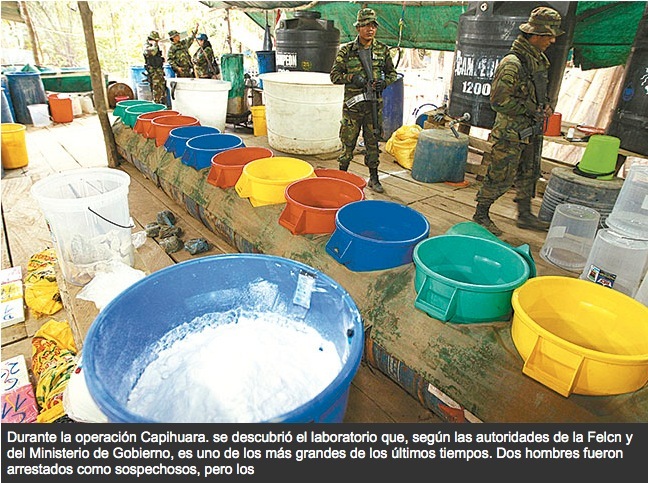 A crystallization of cocaine laboratory where Colombian method was used to process the drug worked for more than a year ago in a kind of island, near a lake on the border between Santa Cruz and Beni. It had 16 rooms, equipped with bedrooms, floating power engine generators, recyclers, and a clandestine airstrip. Government Minister, Jorge Pérez; Vice Minister of Social Defense, Felipe Cáceres; the national chief of the Special Force against Drug Trafficking (FELCN), Mario Centellas and narcotics agents came to this inaccessible place because they even had to travel by boat. The site was discovered in the operation called Capihuara. Perez said that this is one of the largest drug labs found in recent years and stressed the police mission because, they could even find a tree with a scope from where it is believed that snipers guarded day and night the place. Near the track a clandestine laboratory controlled gate with chains was found. The minister said the cocaine base was transported from Peru for refining. The FELCN seized 120 packages ready for export hydrochloride and 50 kilos in a container, plus lots of chemicals and tools for crystallization. Arms ammunition M-16 and AK-47 was also found. It was not possible to arrest the ringleaders, only two suspects. So far this year, 8,159 FELCN practiced operating, was seized 15.7 tons of cocaine, 700.6 tons of marijuana, 42 laboratories crystallization, 31 laboratories and 3,487 recycling factories destroyed also stopped to 2,040 people and seized 14 small planes. Meanwhile, it was learned that in another raid FELCN discovered another lab in Santa Rosa del Sara. This government has expelled the DEA and NAS and gloats that they are fighting narcotraffick, despite labs like the one above seized, they have NEVER captured significant narcs, only the lowest down the food-chain… Now that the illegitimate re-re-election is campaigning openly, news like the one above appear, to give a message they are doing their work?! If indeed the coca should have come from Peru, the result is even more alarming, we lost control over our international borders! I’d say it is just the undeniable truth: narcotraffick is slowly taking over our lives, our country. We are like Colombia in the 70s, 80s… slowly involving those small rural communities in the trade and displaying their “techniques” like having snipers to guard their despicable business. This entry was posted in Beni, Bolivia, Crime and Violence, Drug war - narcotraffick, Environment, Health, Politics, Santa Cruz, Social Unrest and tagged bad politics, cocaine production, narcotraffick, police and judicial corruption, public policy failures. Bookmark the permalink.